Progress On The Learning Curve. Linda had four horses at Fontwell yesterday, all trying to take a step forward on their paths to success. 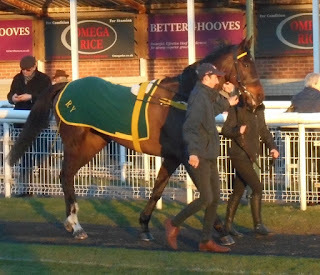 Moneystown came 5th in the handicap chase and will have gained jumping experience from the various questions posed by the Fontwell fences (drops, downhill and wide ditch). but nothing like Brendan Powell on Oakidoaki horizontal in yellow. 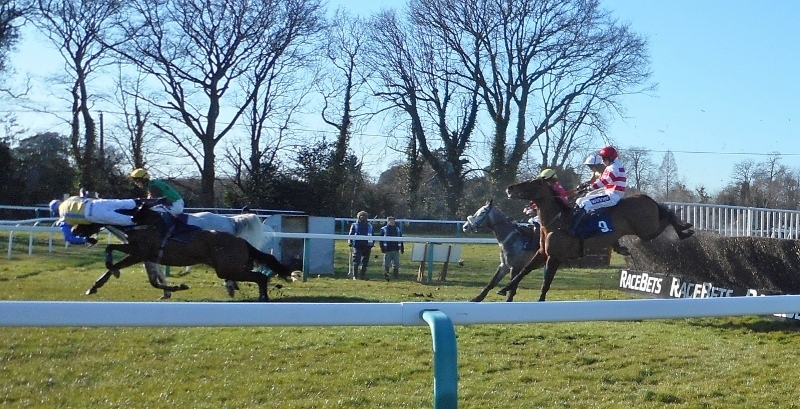 Jolly Jet completed for the first time in the novices hurdle, while Hecton Bay had his first experience of a racecourse in the same race. 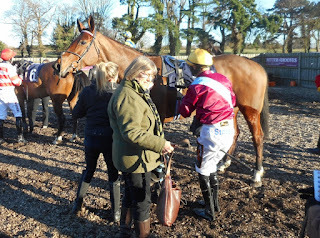 Debrief after Jolly Jet's race. 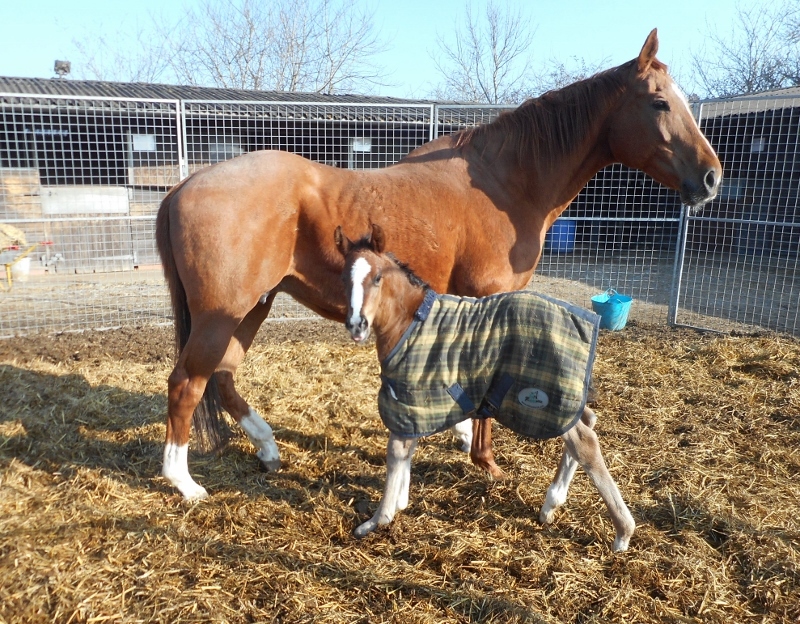 The stable welcomed a new arrival on Tuesday, a filly foal. 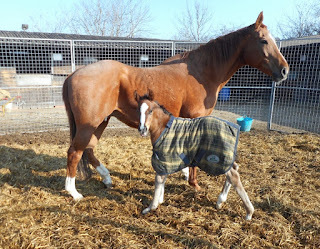 Mother and daughter are doing well. 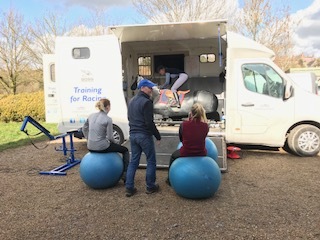 Mobile Training School pay a visit. 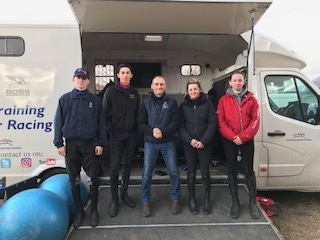 The Mobile Training School called in during the week for a session with the staff. 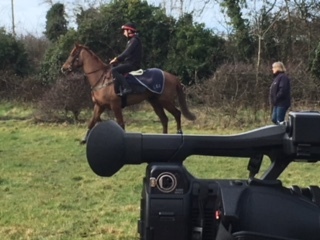 They were filmed on the gallops and had their riding analysed, were given instruction on a variety of aspects of the job and had the chance to use the "equicizer". Both the students and the instructors said that the day had been enjoyable and of great value. More like his old self! 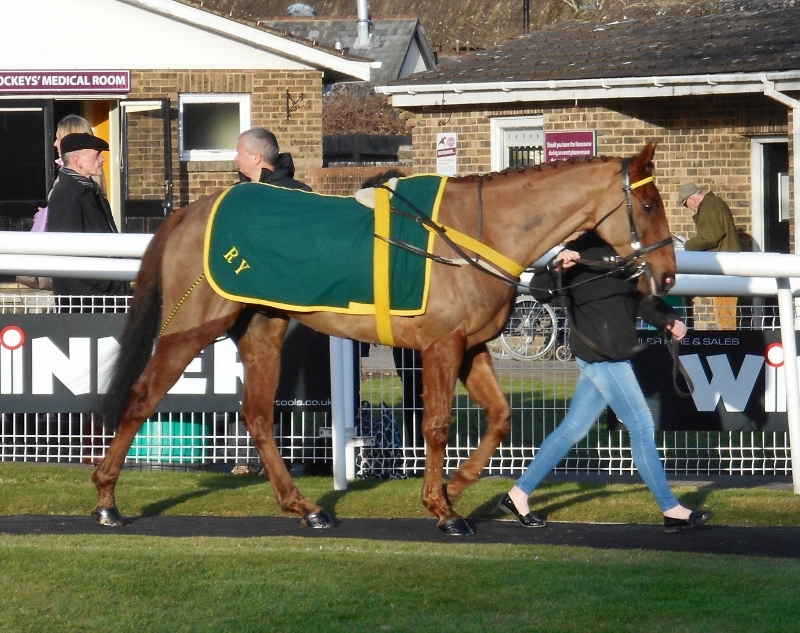 Itoldyou ran a really pleasing race at Fontwell today, finishing second in the 2 mile 6 furlong (0-110) handicap chase on heavy ground. The race was a little shorter than he would like and Tom Cannon was instructed to be up near the pace or even make it if necessary, and this he did. 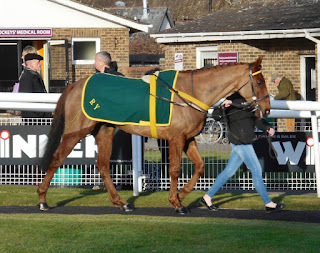 Itoldyou jumped and ran with enthusiasm and was in second place, though being urged along, turning into the final line of fences beginning with the open ditch. Here he made his one mistake, though not looking like falling, and he began to lose his momentum and dropped back into 4th place. He jumped the last still just in 4th place but looking like he would take third. 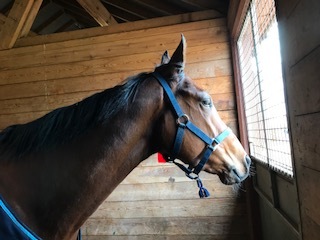 However he kept on so well on the run in that he passed the tiring 3rd and second placed horses gaining the runners up position for himself. 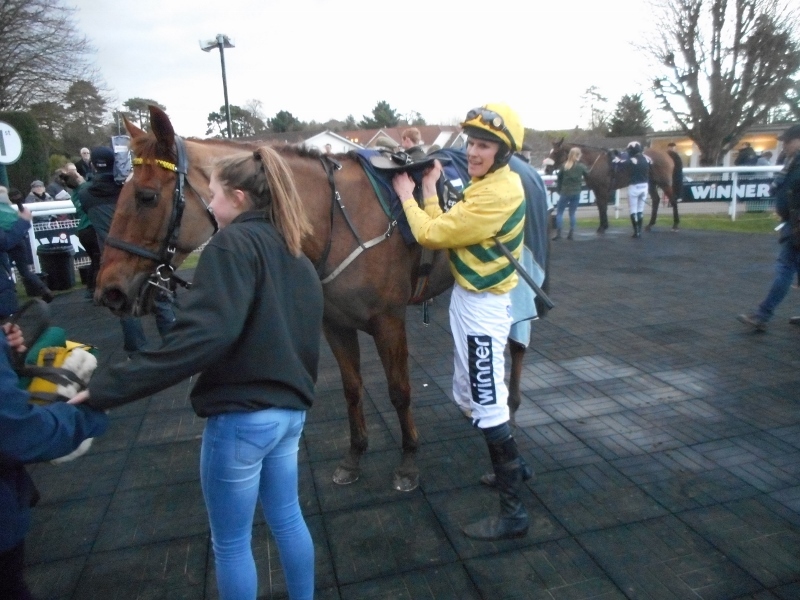 A happy Itoldyou after the race. 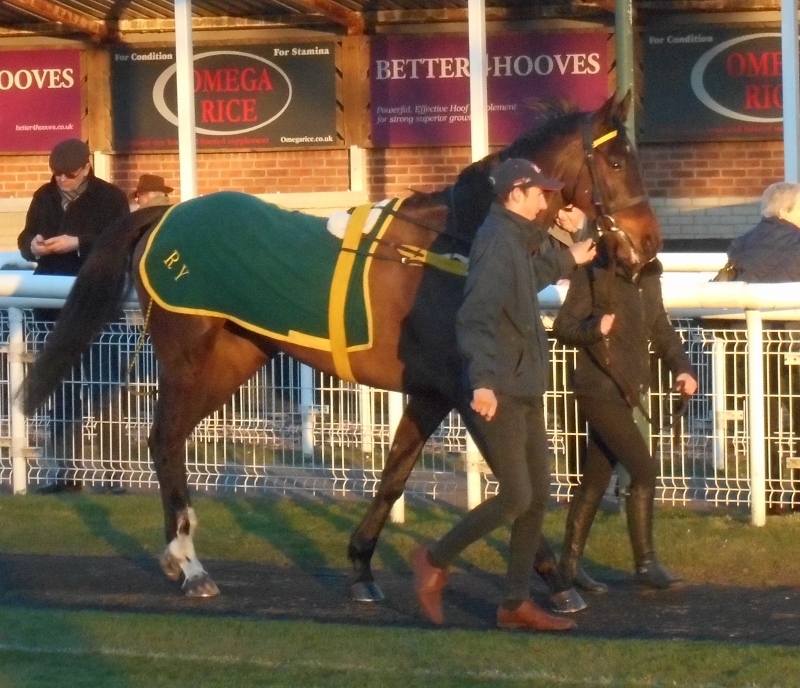 Linda was at the Newmarket Sales today and acquired Dragon Tattoo for the yard. 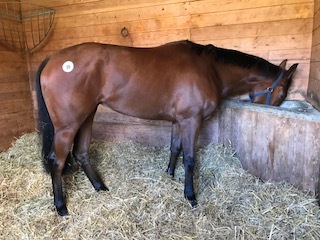 She is expected to arrive at the yard tomorrow. Dragon Tattoo eating up at the sales.